It provides a new modular setup that allows you to decide which tools (“workloads”) you want to install and, most importantly, which ones you don’t want at all. The consequence is that installing VS 2017 is much, much faster (unless you install a lot of workloads, of course). This suggestion had almost 2,000 votes on UserVoice. For VSX developers like me that already have six versions of Visual Studio installed (from VS 2005 to VS 2015) on the main dev machine (not counting isolated installations on virtual machines) and know how painful each installation is, this is big news. Hopefully all this isolation and resilience can prevent the problems that I suffered with VS 2015 when my Surface Pro 4 crashed at boot time due to a buggy antivirus update (I never recovered VS 2015). So far, so good, but all this will cause some issues to VSX developers. I adapted my MZ-Tools extension to run in Visual Studio 2017 some weeks ago and I am these days migrating my old .NET-based custom builder for MZ-Tools to fully embrace MSBuild and hopefully to use a separate Windows Azure build server, better environment/workspaces isolation, etc. The location of devenv.exe for Visual Studio 2017 has changed, and can be several of them. As explained above, you can have now several Visual Studio 2017 installations on your machine. In the past (until Visual Studio 2015) you could query the HKEY_LOCAL_MACHINE\SOFTWARE\WOW6432Node\Microsoft\VisualStudio\14.0, InstallDir entry, to get the (only) installation folder for Visual Studio (2015). Now, there can be several Visual Studio 2017 installation folders (Community, Professional, Enterprise), and you cannot query the registry directly. Instead, the official approach is to use some interop assemblies (Microsoft.VisualStudio.Setup.Configuration.Interop) provided by Microsoft to enumerate the Visual Studio 2017 installations. See the post Changes to Visual Studio “15” Setup and the Microsoft/vs-setup-samples samples on GitHub. Of course, for your own use on your own build script you can hardcode paths ;-). 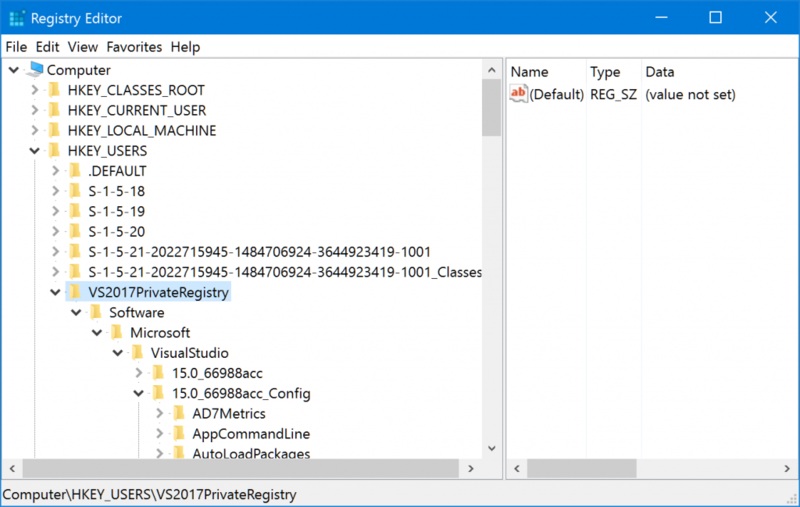 External processes cannot read Visual Studio 2017 registry entries directly. Extensions can read Visual Studio 2017 registry entries from the private registry in a transparent way, because being dlls, they run in-process with devenv.exe and leverage the redirection provided by Visual Studio. But out-of-process executables or scripts need to use the RegLoadAppKey function. See the section “Change: Reduce registry impact” in Breaking Changes in Visual Studio 2017 extensibility. The location of MSBuild for VS 2017 has changed, and can be several of them. In the past (until Visual Studio 2015), the path of MSBuild was “C:\Program Files (x86)\MSBuild\<version>”, where <version> was “4.0”, “12.0” (VS 2013), “14.0” (VS 2015). 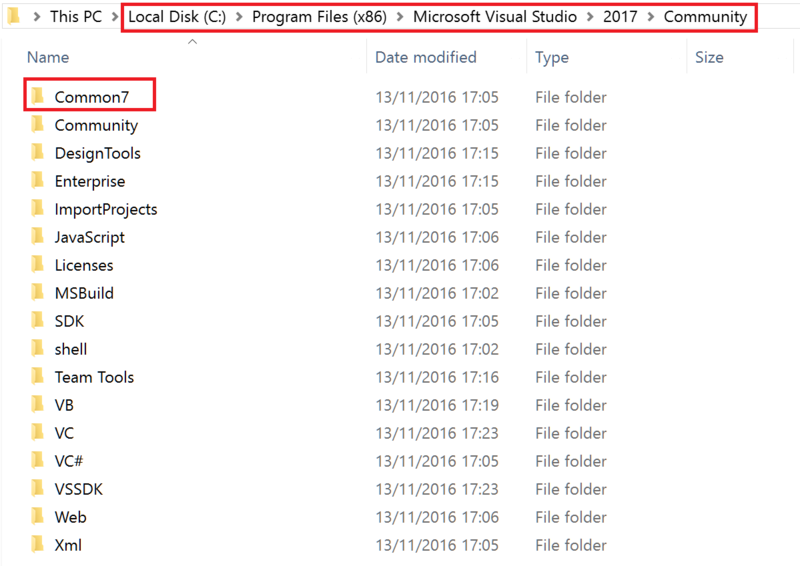 There is no “15.0” folder there for VS 2017. Instead, MSBuild for VS 2017 is installed in the folder “C:\Program Files (x86)\Microsoft Visual Studio\2017\<edition>\MSBuild\15.0”, where edition can be “Community”, “Professional” or “Enterprise”. Again, for your own use on your own build script you can hardcode the path, but if you want to use a more proper way, you need to get the VS 2017 installation folder as explained above and concatenate “MSBuild\15.0”. Or you can wait until Microsoft releases a document about how to resolve MSBuild location (they are working on it and now that MSBuild is open source you can follow the progress on GitHub). BTW, you can download the MSBuild Tools for Visual Studio 2017 RC here. The location of tf.exe (Team Explorer command-line) has changed. In the past, for Visual Studio 2013 and 2015 it was stored in the folder C:\Program Files (x86)\Microsoft Visual Studio <version>\Common7\IDE. For Visual Studio 2017, it is installed in the folder of the Team Explorer extension (C:\Program Files (x86)\Microsoft Visual Studio\2017\<edition>\Common7\IDE\Extensions\<random folder>). Fortunately, there is a shortcut in the folder C:\Program Files (x86)\Microsoft Visual Studio\2017\Community\Common7\IDE\CommonExtensions\Microsoft\TeamFoundation\Team Explorer that point to that location. Did I mention that there can be several editions of Visual Studio 2017 installed? The VsWebSite.Interop.dll automation file is not included in the Core Editor and causes FileNotFoundException. 1) That component installs tons of files related to web development, not only VsWebSite.Interop.dll. The user should not be forced to install web-related stuff (project templates, etc.) that she doesn’t require and that would dirty the Visual Studio installation for that simple extension to work. 2) Even if only VsWebSite.Interop.dll was installed by that Microsoft.VisualStudio.WebTools component it would be annoying for users to install that component. It is a good thing that Microsoft uses EnvDTE / VSLangProj internally and therefore they needed to include them in the Core Editor. Otherwise they wouldn’t be there either. You know that I am not very fan of EnvDTE/VSLangProj although I still use them very heavily (Microsoft has insisted that they are not going to disappear or be deprecated). I hope this post helps you. Happy coding! You mentioned, that some of the assemblies wont be in the GAC anymore. My problem is that I used some of them in my VS2015 extension, but now, the affected assemblies are not in the GAC. Gould you give me advice, what is the best case for it? Which VS assemblies that used to be in the GAC are you trying to use? I was wrong, those assemblies were never in the GAC. The extension is using Microsoft.TeamFoundation. *** 14.0 references, but those assemblies’s version is 15.0 in Visual Studio 2017. If I change the references version from 14.0 to 15.0, the extension is working properly, but I’m not sure is that the correct solution. If your extension only targets VS 2017, then it is correct to use 15.0 references. If it targets VS 2015, you should use 14.0 references, since 15.0 references wouldn’t be present on a machine with only VS 2015. If it targets both VS 2015 and VS 2017 with the same binary dll then it could be tricky. In general Microsoft.TeamFoundation. * assemblies are problematic, they are VS version-specific, and maybe are not backwards-compatible. The safest approach is to ship different VSIX extensions for VS 2015 and VS 2017. Both solution are working, and it seems the references are backward compatible.